I have had relationships shorter than hockey seasons. Eighty-two games is a long time, and this hockey season has felt interminable. Far from feeling like the season started yesterday, after every game, I check the schedule and say, “We still have how many games left?” not at all unlike times I’ve checked my phone during a date and asked myself how much longer it could possibly take to eat dinner. Do we have to get dessert? How about a pay-at-the-counter place? Some combination of things has conspired to make this feel like the worst season in recent memory. Whether it’s scoring at-or-below dead puck era rates, the fact that this is the first uninterrupted season in three years, the instant-gratification nature of the internet, or the fact that some in Pens media had written this year off before it ever began, I found myself ready for this season to be over. Not even ready for the playoffs to start. Ready for the Pens to just not be playing hockey anymore. If you’ve been feeling like this, too, have no fear. I got this one from a dating advice site (only the finest for my PI readers). The advice is pretty simple: find the reason you’re in a relationship with that person to begin with. What attracted you to them? What brought you together? Find the answer to these questions and keep it mind as the months (and years!) go on. So, why did you start following the Penguins at all? Or hockey? What do you like most about the sport? Concentrate on this thing as you watch. If you started watching the Pens for Mario and, later, Jagr, that kind of scoring can be hard to replicate. But focusing on Crosby and Malkin, and the pretty impressive seasons they’re both having given league-wide scoring, keeps the game interesting. Every shift Lapierre is on the ice doesn’t have to be a trial of patience; instead, it’s anticipation for the next Crosby or Malkin shift. If you’re more of a lover of defense, following the rise to prominence of Kris Letang has been, at times this year, breathtaking. And with the young talent the Pens have on the blue line, it should be an area to follow for years to come. A four-game losing streak and a sloppy game against the tanking Arizona Coyotes: your relationship is in a rough patch. But the team is trying. A win is a win after all and though it may not be impressive to out possess the Coyotes, the Pens did, at least, which means they’re getting the process stuff right. This is a good sign – a sign that your relationship has happier days ahead. Over the last 25 games, dating back to January 28th’s loss to the Washington Capitals, the Penguins have been the top score-adjusted Fenwick team in the league. This is nothing to scoff at. Over that same period, at 5 v 5, the Penguins have shot at 4.9%. It feels like a rough patch, but this means the foundation is good. If over the remaining games (and, most importantly, the playoffs), the Penguins’ luck turns around, the scoring will come. You can’t control when you score goals, but you can control whether it’s more likely that you or your opponent scores goals, and the Penguins are doing right in this regard. 3. Players are People, too. If you’re someone who is at all invested in your team’s favorite players as people, off the ice, the Pens are having a great season. Catch new episodes of In the Room online. It’s emotional, but watching Dupuis talk about wanting to come back this year, and seeing how much respect and love his teammates have for him, has been a good reminder that when the goals aren’t coming, my favorite players are people too. Dupuis and Letang are great on social media for their chirps. And their pictures of cute kids. 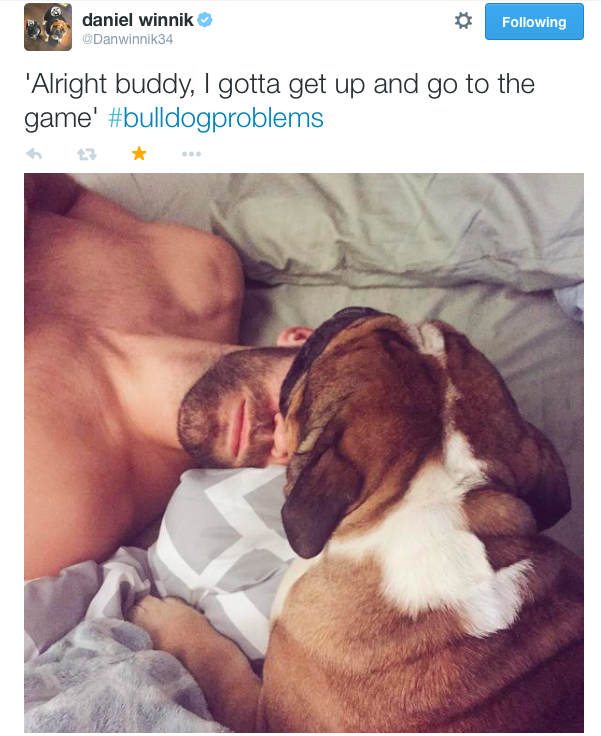 Daniel Winnik loves to take pictures of his dog. 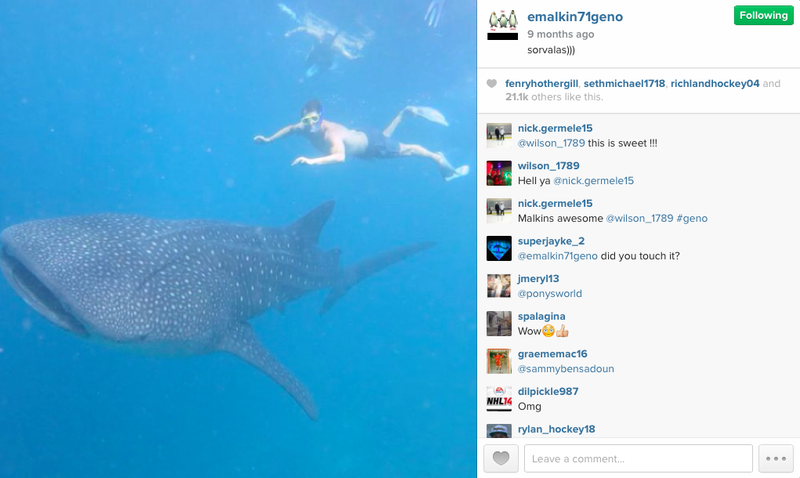 Evgeni Malkin asks important questions and provides great vacation scenery. 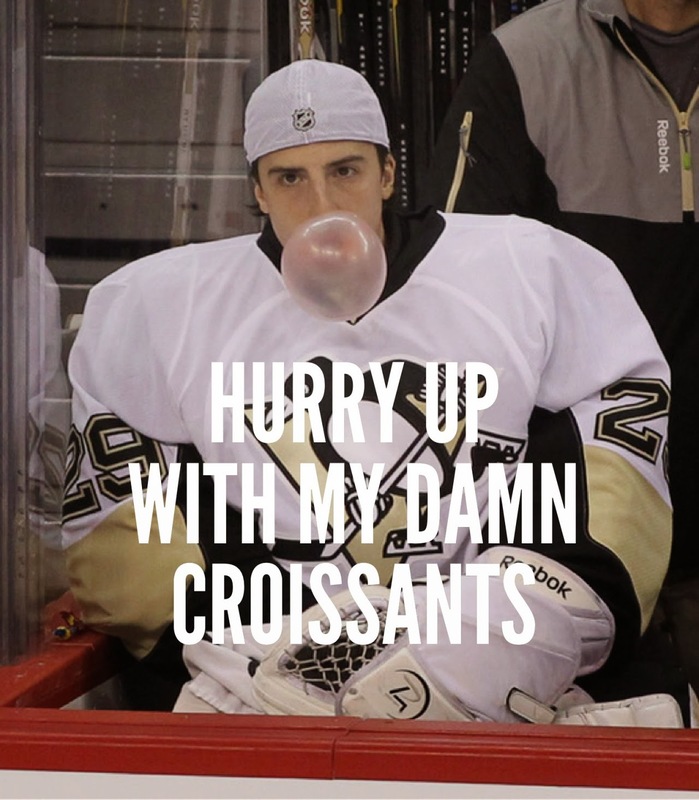 Something for every Penguins fan. Commentators love to say that an 82 game season is a marathon, not a sprint. You have to pace yourself. Don’t be afraid to take some space. Try watching a game away from twitter (it’s one of the most liberating experiences I’ve had in the last year—your own impressions of the game without filtering through the reactions of other people). Know the next game against the Sabres is going to be a snoozefest? Or that the next game against the Flyers will be bloody? Take a night off. Sometimes taking a break from the thing you love can be refreshing. And don’t let other people tell you how to be a fan: your relationship with the team is your own. Needing a night off doesn’t make you less invested; it makes you someone in it for the long haul. You feel that itch. The Penguins just allowed Brandon Dubinsky to score two goals. They look drunk. Your phone is in reach. You want to tell twitter that this is not only the worst Penguins team you’ve seen since Crosby’s first year in the league but also that the Penguins are probably the worst team in a playoff position. Hell, at this rate, you think they might not even make the playoffs. Keep the lines of communication open and don’t be afraid to tell twitter. In the morning, you might want to walk it back. Someone will probably tell you to #logoff. But you got your feelings out there, and you opened yourself up to being talked down. People can now remind you of the good things. Let them into your heart. Conversely, do you really love to watch the Penguins put up 8 on a struggling goalie? Or do you enjoy the unsustainably high scoring games? Don’t be silenced by people who insist “show me this in the playoffs,” or the ones who say the Pens will play better teams in May. No one is disputing this. But sometimes it’s just fun to watch your team make another team look silly. Like what you like. It’s the only way to make it through the year. NOTE: This is not good interpersonal relationship advice.